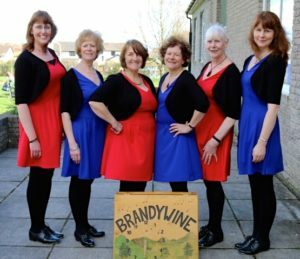 Established in 1991 and based near Newport, Brandywine Cloggers perform a style of high energy, percussive step dance, developed in the Appalachian Mountains of eastern USA, with origins in the folk dances introduced by the settlers. Appalachian clog is a lively, improvisatory dance style encompassing elements of English, Irish, African-American, and Native American footwork and rhythms. Originally those with workday boots danced in them whilst poorer performers danced in bare feet. Today clogging is more stylised and dancers wear leather shoes with steel heel and toe taps. We choreograph our own dances, synchronising percussive stepping with bluegrass and old time tunes performed by our string band, The Grey River Boys.